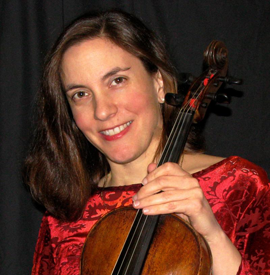 Violist MARIA LAMBROS has performed as a chamber musician throughout the world as a member of three of the country's finest string quartets in venues such as the Concertgebouw in Amsterdam, London's Wigmore Hall, the Konzerthaus in Vienna, New York's Lincoln Center and Weill Recital Hall at Carnegie Hall and the Library of Congress in Washington, D.C. She was a member of the renowned Ridge String Quartet, which was nominated for the 1993 Grammy Award for Best Chamber Music Performance for their recording of the Dvorak Piano Quintets with pianist Rudolf Firkusny on the RCA label. The recording won Europe's prestigious Diapason d'Or in the same year. She was also a founding member of the Naumburg Award-winning Meliora String Quartet, which was Quartet-in-Residence at the Spoleto Festivals of the U.S., Italy and Australia, and which recorded Mendelssohn's Octet with the Cleveland Quartet on the Telarc label. She was most recently a member of the Mendelssohn String Quartet and is currently the violist with the New York based chamber ensemble, La Fenice. Maria Lambros appears regularly at a number of major chamber music festivals, including those of Aspen, Vancouver, Santa Fe, Tanglewood, La Jolla, Caramoor, Helsinki, Norfolk, Rockport, Skaneateles, Bard, Cascade Head, Chamber Music West, New York's Mostly Mozart Festival and the Chateau Series in Turin, Italy. She has also performed with the Chamber Music Society of Lincoln Center, DaCamera Society and Context of Houston and with the Guarneri, Cleveland, Juilliard, Muir, Brentano, Borromeo, Colorado and Orion Quartets, among others. Maria Lambros attended the Eastman School of Music, where she received the Performer's Certificate and earned a Master's degree in Humanities from New York University. A native of Missoula, Montana, she was named one of "Montana's Leading Artists and Entertainers of the 2oth Century," a millenial list highlighting the last 100 years of Montanans' exceptional contributions to art and culture. A devoted teacher, Ms. Lambros is currently a member of the chamber music faculty of the Peabody Conservatory of Music and has been on the faculties of the Conservatory of Music at Purchase College, Harvard University, University of Delaware, Florida State University and the Longy School of Music. She is a faculty member of the Yellow Barn Music School and resides in Baltimore, MD, with her husband, cellist Michael Kannen and their son, Daniel.